How can Flint be made whole? The water crisis in Flint, Michigan began when government officials switched the city’s water supply to the Flint River in January 2014, and chose to not apply corrosion controls to the water. Now, lead from approximately 15,000 lead pipes has made many people sick, and rendered the water system unusable until new controls are in place, or all lead pipes are replaced. Government indifference or neglect allowed this to happen to save money, and residents are rightly indignant, with many already involved in legal action against the city and the state. But what are the likely outcomes of this litigation? In order to succeed at all, the residents would need to demonstrate gross negligence in order to overcome the sovereign immunity status that the government possesses under the law. Even if they are able to do this, most remedies are likely to be piece-meal and non-monetary because the residents will not be able to show present injury. Significant damage may occur to individuals from drinking the water, but few effects are visible now, and only one lawsuit has so far been filed based on individual injury. If individual injury cases succeed, plaintiffs should receive damages for demonstrated harms, as well as medical monitoring costs. Yet these remedies will not fully compensate for depreciated home values, or less tangible losses (such as to public image), that Flint has suffered. One way for Flint residents to recover more may be through EPA involvement. The agency can threaten lawsuits against individual politicians, or negotiate with state officials to mandate a clean-up of the water system through Section 122 of CERCLA (42 USC §9622). Whether Flint qualifies as a CERCLA clean-up site will depend on the judgment of President Obama’s appointed water czar for Flint, Nicole Lurie. However, as the substantial amount of lead contamination is unquestionable, and water pipes qualify as a “facility” under the statute, this is a likely result. 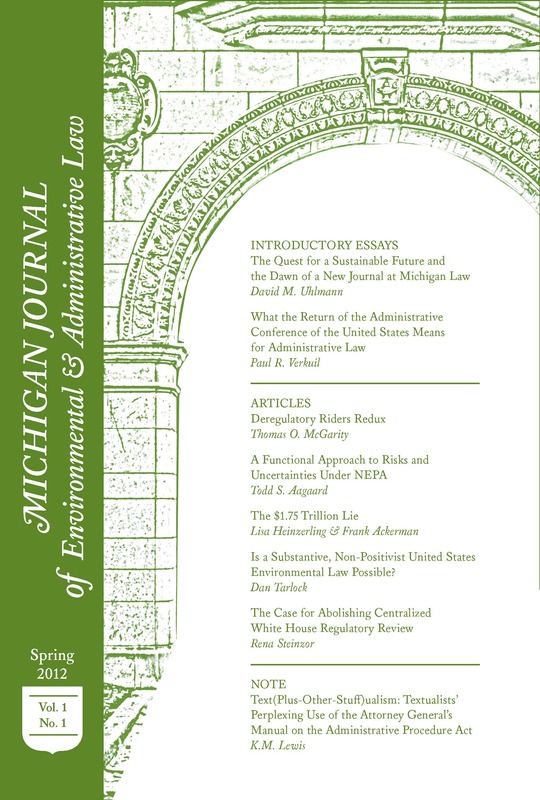 The only worry for residents is that EPA negotiations may pre-empt residents’ later claims, as CERCLA agreements aim to “expedite remedial actions and to minimize litigation.” However, given the public backlash that state and federal environmental agencies have already faced, the EPA, or Michigan DEQ, is unlikely to negotiate any agreement that forecloses liability through citizen suits. Furthermore, some private parties may also be able to earn comprehensive remedies. Restoration damages in environmental law help make an individual or community’s property whole, typically when lost market value for a property is an inadequate measure of compensation. Michigan is one of 35 states that allow the amount of restoration damages to exceed the diminution in value of a particular property. The major requirement under case law, and Section 929 of the Second Restatement of Torts, is that restoration damages require “reasons personal,” or special property or community damages, to allow recovery. Case law suggests that special harms are shown when intentional conduct renders a community unlivable, especially in communities where property values do not match the social value residents attach to their land. Most issuances of restoration damages involve long-standing environmental hazards that severely affect a particular community. In Escamilla v. ASARCO, Inc., No. 91-CV-5716 (Colo. Denver Dist. Ct. Apr. 23, 1993), a smelter had operated near a low-income Denver community for decades, polluting properties and causing $4 million in damages. The jury awarded $20 million in restoration damages in order to rebuild the community. In Corbello v. Iowa Production, 850 So.2d 686 (La. 2003), an oil company leased property from a landowner for resource extraction, but over the course of 70 years polluted the property through, inter alia, improperly disposing of saltwater. The undamaged value of the property was $108,000, but the Plaintiff earned $33 million in order to restore their property. Finally, in Sunburst Sch. Dist. No. 2 v. Texaco, Inc., 163 P.3d 1079 (Mont. 2007), a gas refinery released hydrocarbons under a town for 30 years, causing $2 million in property damages. Defendant failed EPA clean-up requirements, necessitating a private lawsuit, and leading to a $15 million restoration damages recovery. Similar to the above cases, widespread harm to an entire community has occurred in Flint, suggesting that individual remedies may be insufficient to compensate for the harms felt by the community. Residents might reasonably argue that all properties in Flint will continue to lose value due to a perceived risk of lead exposure, even when lead pipes in those homes, or in entire parts of the city, are replaced. Flint’s harms, though severe, do not exactly align with the typical restoration damages scenario. Unique property damage is less clear here, as replacing lead pipes should be sufficient to forestall further injury. Beyond property damage, health impacts are a major concern in Flint, but restoration damages are designed for property harms, so this may not be the right vehicle for those recoveries. In addition, most previous restoration damages cases involved private defendants whose decisions were clearly intentional; proving gross negligence of public officials will be feasible but challenging. Finally, although restoration damages do not require decades of pollution, most cases had long-standing harms. Flint’s crisis, though severe, has only lasted 2 years. Alternatively, the state may decide to “restore” Flint’s pipes absent legal action. Yet this resolution is unlikely, especially in the short term. An expected cost of $55 million is unlikely to appeal to fiscally conservative Governor Snyder, though he may decide to do more due to a sense of personal responsibility for this crisis. He could even look for inspiration to Lansing, MIs lead pipe replacement program, which aims to replace 13,500 pipes in the city’s water system. Unfortunately, that program is still under way, despite operating since 2004 and costing around $42 million. The people of Flint cannot wait 10 years for clean water. Restoration damages or CERCLA-led clean-up can both solve this crisis more quickly than piecemeal lawsuits or state action. CERCLA has the advantage of federal government oversight, ensuring that any mandated clean-up will be seen through to completion. Restoration damages would be especially effective for properties in Flint that hold special meaning for the community. No case law has found an entire city to qualify as a specially affected community, but Flint could become the first by arguing that their social fabric, and the well-being of its citizens, was irreparably altered by this crisis. If either remedy succeeds, it would send a powerful signal to areas with similar lead issues. In 2014, 8.5% of children in Pennsylvania were found to have elevated levels of lead in their bodies, compared to 4.9% of children in Flint. The CDC estimates that 535,000 children from 1 to 5 years old nationwide suffer from lead poisoning. This tragedy is not unique to Flint. But thus far, no political or legal will has been sufficient to require the wholesale replacement of dangerous lead pipes. Lead in gasoline was phased out in the U.S. amid widespread health concerns. Perhaps this crisis, and its health and community impacts, can do the same for lead water pipes. Julie Bosman. Why it won’t be easy or cheap to fix Flint’s water. Steven Siros. President Obama appoints water czar to address Flint water issues (Jan. 20, 2016). Jenner and Block Corporate Envt’l Lawyer. Last accessed 2/15/16. http://environblog.jenner.com/corporate_environmental_l/2016/01/president-obama-appoints-water-czar-to-address-flint-water-issues.html. CERCLA and Flint, Michigan. Don’t Waste Arizona. Last accessed 2/15/16. http://dontwastearizona.org/pdfs/flint16.pdf. Carol Dinkins. CERCLA Settlement Considerations. A recent Ninth Circuit case found that, despite Defendant’s non-compliance with a water clean-up order, CERCLA Section 113(h) disallowed citizen suits for penalties to remedy that non-compliance. See Citizen Suit Watch. Crowell Moring. Last accessed 2/15/16. https://www.crowell.com/NewsEvents/AlertsNewsletters/Environment-Energy-Resources-Law-Alert/CITIZEN-SUIT-WATCH-Ninth-Circuit-Rejects-CERCLA-Citizen-Suit-Jurisdiction-Over-Pursuit-of-UAO-Penalties. Jon Rauchway et. al. Environmental Restoration Damages: A New Trend of Regulating Cleanups through Private Lawsuits. Rocky Mountain Mineral Law Foundation Annual Institute (July 19, 2014). Last accessed 2/15/16. http://www.dgslaw.com/images/materials/RMMLF-Rauchway-Stevenson.pdf. Id. See also Randy Tanner, Sunburst School District No. 2 v. Texaco, Inc.: Rethinking restoration damages as a Remedy for Tortious Injury to Land and Property. 70 Mont. L. Rev. 291 (2009).